Wisdom Learning CEO, Rod Hattch founded Wisdom in 2002, and since then he and his partners have taken an active role to providing the best service for clients within the Canberra community. We chat with Rod to gain insights into the origins and ethos of the business and how you get to being the best. How did Wisdom Learning come to be? I have been in the learning and development business since 1996 and I started Wisdom Learning in 2002. I was a sole trader for many years and as our reputation began to grow, so did the company. In 2016 I welcomed Jana Clyde, Wisdom’s Director, into the business ownership. Together with Jana, we have continued to build Wisdom to become a multi-award-winning successful, profitable and sustainable business. Jana and myself are ‘hands on’ in the business, not only playing an active part in the day to day operations of the business, but also in delivering services to our clients. Our commitment as Leaders/Directors to our team and the clients, have lead the way for Wisdom to grow as it has. We pride ourselves on our professionalism in everything we do and we ensure we are setting and maintaining high standards of service at all times. Our values of innovation, honesty, respect and humility, underpin our everyday practice. Wisdom offers 24 national qualifications on its scope of registration, from Certificate III to Graduate Diploma levels. These qualifications span across: Property Services; Training and Education; Business Services including leadership and project management; and Government. We also offer a wide range of public and private courses/workshops/qualifications that we design and facilitate throughout the year. Our courses available to individual participants and organisations are both accredited and non-accredited training in the areas of; Customer Service, Leadership and Management, Teams, Real Estate, Government, Learning and Development. We are focused on continuing to create learning partnerships with organisations to build capability and solve business. Who exactly is your customer/client? Public and private sector organisations that need to enhance their performance by developing the capability of their people. We work in learning partnerships in a variety of sectors servicing clients across industries touching almost every element of the Australian economy including Finance, Tourism, Media, Education, Logistics, Building and construction, Transport, Property, Energy, Health, Aged Care, Retail, Professional services, Accommodation and food services, Real estate services, Equipment hire, Scientific and technical services, Infrastructure, Medical, Airports, Defence industries and Not for profit. What makes wisdom different from other providers? We have three key focuses in our model; educational excellence, service excellence and business excellence. For each program, these 3 focuses are all centered around our individual client outcomes. Wisdom has a two decade long history with a 95% retention rate of clients! Feedback shows that we have created a company where clients want to work with us because we give them confidence in our strong ability to help them and their teams learn and achieve outcomes. Coupled with our recognised and awarded quality of service and our robust systems to provide them with the support and information they need. Within Canberra, what is your most popular service? We deliver nationally and within Canberra we deliver a range of popular programs in line with business requirements. It is hard to pin point one as we continuously have our clients returning with further training ideas they want us to develop, design and facilitate. As well as the stream of referrals we have from participants or companies spreading the good word about Wisdom. When did you consider your business a success? We have been fortunate in that Wisdom has been sustainably successful for its entire 22 years. We are proud of our sustained success which we believe is a direct result of good governance, business processes, a fabulous team and of course hard work; as all business owners would attest to. You were nominated for ‘Australian Small Training Provider of the Year’, how have you found this process? 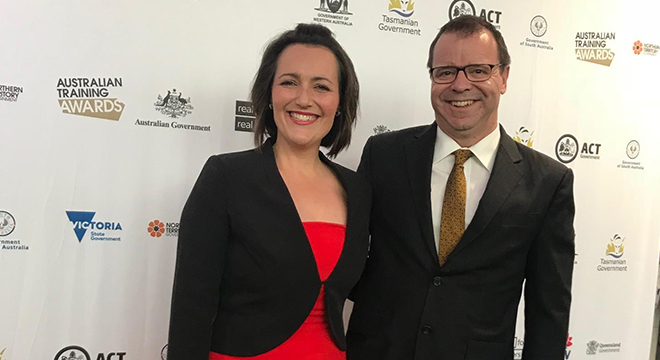 Winning the ACT Small Training Provider of the Year Award was the first step in the pursuit of Australian Small Training Provider of the Year. We have valued highly the interviews, onsite validations and our presentation in Sydney to the national judge’s panel. It is a form of recognition and acknowledgement that our vision, mission and values manifest in rewarding and fulfilling client learning experiences and results. Explain to us about BHAG (Big Hairy Audacious Goal). How does your values effect the clients you attract and the staff you employ? Our BHAG is to help 1,000,000 people reach their potential. Bolstered by our vision to help people and organisations reach their full potential, the BHAG is an inspirational goal set by our whole team as part of our strategic planning. We run a business underpinned by our values, this means we look to work with organisations and staff that we are aligned with. I think that talent is attracted to Wisdom’s good working conditions, open-minded leadership, its nurtured and protected positive atmosphere. The BHAG represents one of the initiatives that have helped us to become a ‘destination company’ for employees. Our highly qualified talent pursue long-term positions with Wisdom to grow, learn and be part of a culture looking to achieve. What do you think the future for the training sector is within Australia and internationally? Wisdom operates in a competitive environment that features constant change in areas such as government policies, economic variables, social changes, competitive pressures and technological advancements. So too, the national and local VET industry is complex and rapidly changing in response to the changing political and regulatory. This backdrop is characterised by a continuing need to ensure the sector is more industry/client focused, human-centred and delivers quality training outcomes for participants and employers. It’s going to continue to be competitive and we are committed to quality outcomes for our clients. As in any competitive industry only the quality providers will survive. Do you have any client success stories that make you proud? We have many! A recent example is our learning partnership with Ignite services, a national talent services organisation that provides specialist recruitment, on-demand talent and outsourced people services Canberra branch. Ignites leadership team completed two qualifications tailored to their business requirements. Seeing the confidence growth of the Ignite leadership team, the business initiatives they were able to implement and getting feedback from Nicole Shephard, Ignite’s General Manager about the course is a great reflection of the value of quality learning. “I can not praise Wisdom enough for their high levels of engagement and the true partnership they created between our business and theirs. We were able to weave in what was happening in real time into the course. I saw so many tangible outcomes across both the business and individuals” Nicole Shephard, General Manager Ignite Services. I think it is in your blood. Entrepreneurship alone is not enough to create successful, sustainable businesses. Entrepreneurship needs sound business management and strategy, commitment, energy and willingness to put in the hard work to realise it.